This is so funny! I just sent the four-pack to my friend James for his birthday next week (the idea was all thanks to your site, of course!). He too commented on the sweet smell as he opened the packages. I told him, and I’ll tell you: I read in Cooks’ Illustrated that a good way to store bacon is to roll up the slices individually into little coils and freeze them separately. That way you don’t have to defrost a whole pack just to use a few slices. Not a bad tip, I think. Enjoy! That’s so great… I hope he loved it! 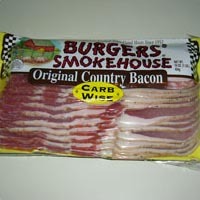 I really want to try the cob smoked bacon because it sounds so unusual and delicious. That’s next on the list. Thanks for the freezer tip! It’s perfect timing because I was just thinking that I should freeze some but was worried about having to defrost the whole thing at one time. Brilliant idea! UPDATE: I have since eaten more bacon, but this time it has been fried. The taste and texture were markedly improved. 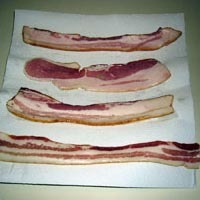 I think that the microwave cooks bacon a little too evenly. When pan-fried, the fatty parts stayed a little fatty, but they also were more flavorful and juicy. 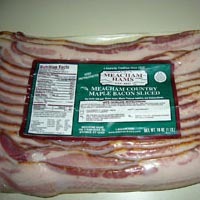 The Meacham Maple Cured Bacon is still my favorite and it’s absolutely fantastic. UPDATE #2: I have now tried all the bacon, pan fried. It tastes about a million times better in the pan, so now I will dirty as many dishes as it takes to do side-by-side bacon comparisons. These bacons are all fantastic, with maybe the exception of the Gatton Farms Bacon—I still found it to be a bit too smoky for my taste, but it’s much better pan fried that microwaved. i had never heard of the Grateful Palate but i just received a birthday gift in the mail from them. my friend sent me NINE different kinds, including the North Co. Cob Smoked Cured Bacon. this is one of the best gifts i have ever received and i haven’t even tried any of it yet (i’d love to do the side-by-side comparison but that’s a lot of bacon to eat in one sitting). You must have an awesome friend—that’s SUCH a great gift! I hope you enjoy eating all your Grateful Palate bacons! If you feel like doing a bacon review, let me know—I love to hear about all kinds of bacon! my friend is, indeed, the Queen of Gifts. i’ve only tried the last one so far & i think it may be the same one you reviewed as i found it overly smokey (although my husband really liked it). Okay, I just have to say it… I’m SO jealous! All your bacons sound incredible. Please, please, please tell me how the North Country Cob Smoked Bacon is. I’ve never had cob smoked bacon, but a lot of people swear by it. Mmmmm. 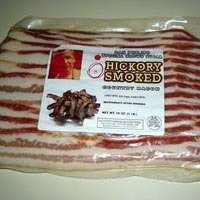 the friend who sent me this cornucopia of bacon will be coming up for a visit from cali @ the end of this month. i’m thinking i’ll stage a bacon tasting when she’s here. i’ll keep you posted. Oh that’s such a great idea… I heart bacon tastings!! Please do let me know about the cob when you try it. Enjoy! hey, we tried it & loved it. it’s very smoky but in a different way than the dan philips double-smoked; mellower & deeper. it’s not especially salty & it’s very meaty. very low fat ratio. personally, i prefer that but it does tend to make it a less crispy bacon. oh, & fyi, i tried the bacon rolling method for freezing & it really does the trick. Mmmmm. That sounds great. I really think I might have to place an order soon. 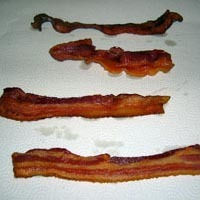 What ended up being your favorite bacon? this is really late (& not at all up to your rating standards) but i thought iâ€™d share it with you anyway. 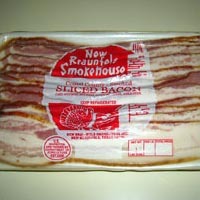 Is this the same NorthCountryBacon featured on the Today Show? Based in N.H.?